Pitru Paksh or Shradh is the time when Hindus pay respect to their ancestors by performing rituals and forbidding themselves to do certain things.It is a 16 days lunar period as per the Hindu Panchang,which is dedicated to our ancestors in the form of prayers and offerings.This is observed from the 1st Tithi of the Ashwin Maas and continues till New Moon day (Amavasya) also known as Sarvapitri Amavysya or Mahalaya Amavysya. This year, In 2018 Pitru Paksha commenced on 24th of September and will end on 8th of October. The day of the Shraadh is usually decided by the pandit or priest, keeping in mind the death anniversary of the ancestor for whom the Shraadh has to be performed. When, The legendary Karna departed to the heaven after the epic war Mahabharata he was offered gold and jewels in the place of food. The legendary Karna was hungry so he walked to God Indra and asked for the real food. Indra said that he donated gold and never offered food to his ancestors in his whole life. To turn back the situation and to correct his mistake, Karna was permitted to go back to earth for 15 days so that he could donate food and water in the memory of their ancestors which eases his own stay in the heaven and after that, this period was known to the people as Pitru Paksha or shradh. Neimitik, Nitya, Vriddhi, Kaamya, Sapindan, Paarvann, Goshtth, Karmaang, Deivik, Oupcharik, Shurdhyarth and Saanvatsarik Shradh. The Pitru Paksh or Shradh is usually performed bare-chested, as the position of the sacred thread worn by him needs to be changed multiple times during the ceremony. The Shradh involves pinda-daan, which is an offering to the ancestors of pindas (cooked rice and barley flour balls mixed with ghee and black sesame seeds), accompanying the release of water from the hand. The male who performs the Shradh should take a purifying bath beforehand and is expected to wear a dhoti. He wears a ring of kush grass. Then the ancestors are invoked to reside in the ring. The food offering is then made, cooked especially for the ceremony on the roof. The food offerings made to the ancestors are usually cooked in silver or copper vessels and typically placed on a banana leaf or cups made of dried leaves. The food must include Kheer (a type of sweet rice and milk), lapsi (a sweet porridge made of wheat grains), rice, dal (lentils), the vegetable of spring bean (guar) and a yellow gourd (pumpkin). 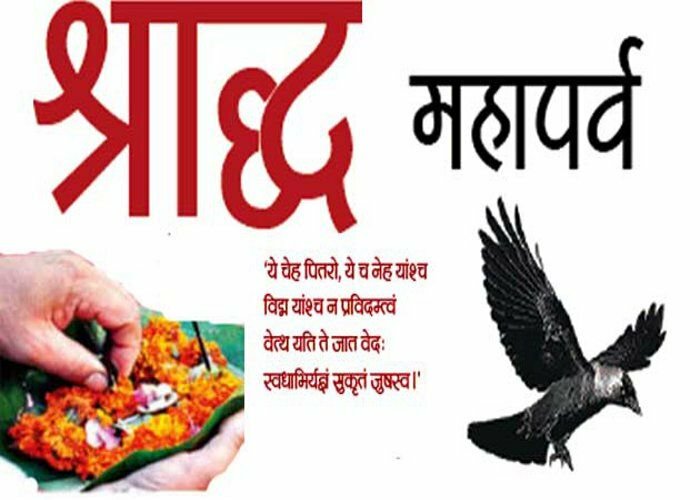 The offering is considered to be accepted if a crow arrives and devours the food; the bird is believed to be a messenger from Yama or the spirit of the ancestors. A cow and a dog are also fed, and Brahmin priests are also offered food. Once the ancestors (crow) and Brahmins have eaten, the family members can begin lunch. During this period, Hindus didn’t begins any new work.Meat and meat products including eggs should not be consumed during this period. Pure satvik food that must not include meat and even onions and garlic are consumed during this period. Pitru Paksh or Shradh is the time when Hindus pay respect to their ancestors by performing rituals and forbidding themselves to do certain things.